Is Your Ceramic Tile a Safety Hazard? Many people have ceramic tile floors in their home or business. They might look great, but when the floor gets wet from a substance, they can become slippery and dangerous to walk on. People can slip and fall, causing injuries—a liability no business or homeowner wants to face. Some spills and wet flooring cannot be predicted, but there are ways of warning people passing by of the potential danger. 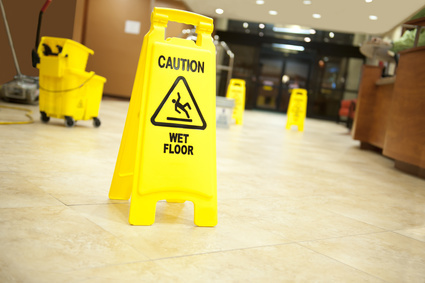 If the floor has just been mopped, a spill just cleaned up, or a leak being taken care of, having a “Caution: Wet Floor” sign in certain places can help avoid accidents. These floors must be checked frequently. Any spills should be taken care of immediately to avoid any unnecessary accidents. What Makes the Floor Slick? There are specific flooring types that will be more slippery than others. These include marble, tile, and terrazzo. Marble and tile flooring are very common in kitchen and bathroom areas due to them being easy to clean, but they can present a hazard when they get wet or if a slippery substance is spilled. There are many challenges to maintaining a floor. It is an ongoing job to determine the cause and then find a solution. If you have questions or concerns and need to talk to an expert, contact The Grime Stoppers today for a free consultation.